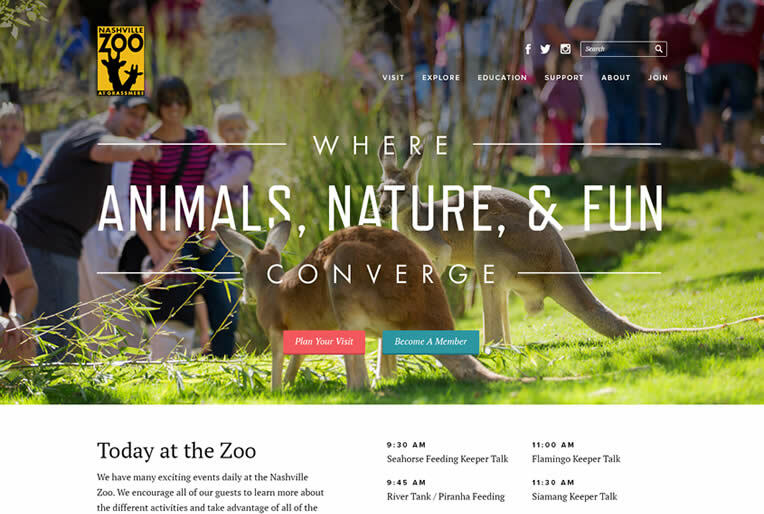 Looking for a way to further engage their website visitors and to increase time spent on website, the Nashville Zoo sought to make essential information easy to access and place emphasis on their conservation efforts. Website brings experience to life. After conducting brand research with the zoo (along with a visit or two), we created a website concept. The zoo’s tagline "Where Animals, Nature & Fun Converge" blends beautifully with vivid imagery to bring their stunning exhibits to life on the web. The overall feel of the website presents the zoo as a fun, family oriented experience that will drive traffic and sales for the organization. With competition for a family’s time and attention being high, it was important to differentiate this family attraction online with a professionally designed website and optimization activities. The website also emphasizes ways to get involved with conversation efforts and learning opportunities that the zoo offers locally. Our experience with Speak Creative has been nothing short of incredible. We launched our website in August 2014, and Speak was (and is, even a year later) very responsive throughout the entire process. We were assigned an account manager who always made us feel like her top priority and only client. Everyone I’ve spoken to on the Speak team have all been open, honest and timely in their responses. During the design process, Speak was so good about asking the questions you didn’t know you needed to be asked. Speak’s designers and account managers are great at working with multiple departments/interest groups within your organization and making them feel heard. They genuinely considered everyone’s needs during the website design process. I have no idea how they manage it all, it’s truly impressive, and we couldn’t be happier with the result. 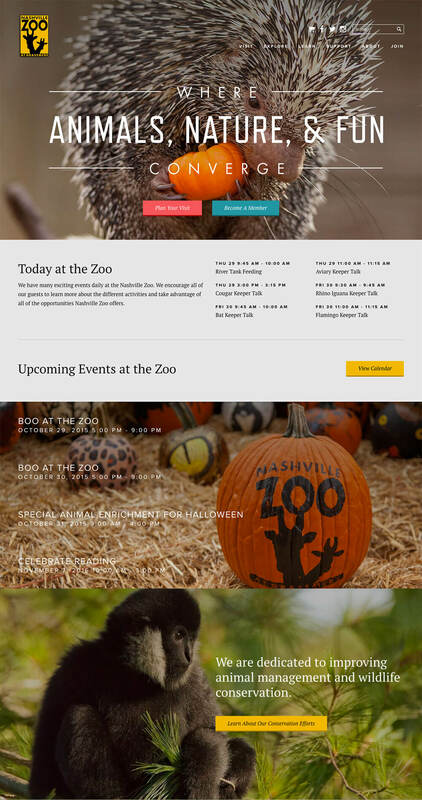 Some of our favorite aspects of this website are the vibrant, full width images and how upcoming events are prominently featured on the home page, inviting the online user to come experience all Nashville Zoo has to offer in person. 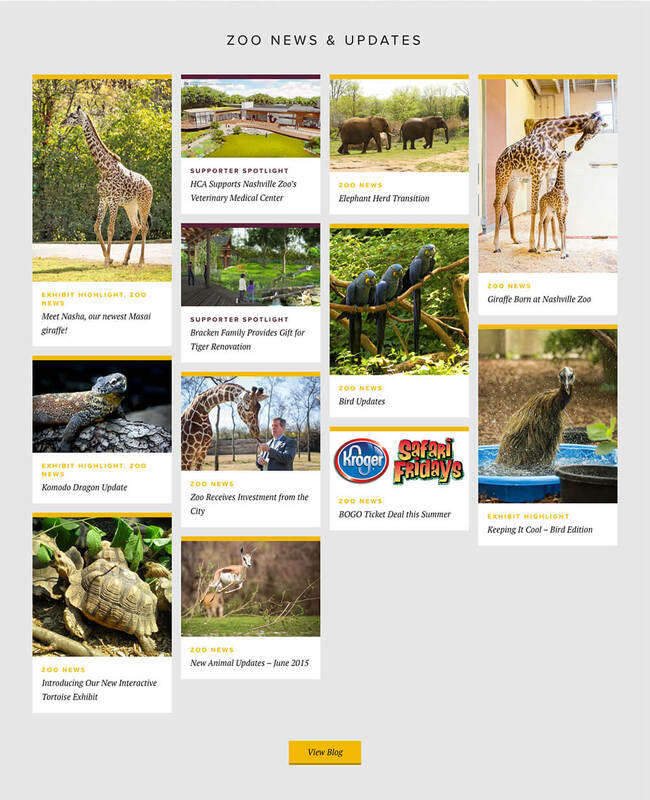 Because the site is built on our Capacity content management system, the navigation and content is flexible enough to allow zoo employees to make changes as needed.